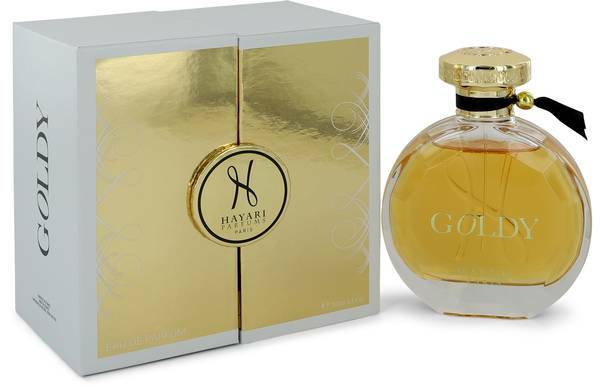 Hayari Goldy Perfume by Hayari, Choose Hayari Goldy when you want to wear the epitome of French luxury . This scent was released in 2012, only one year after the company's first foray into perfumes. Musk and jasmine mix together for a sensual bouquet that will follow you wherever you go. Just under these classic aromas are hints of sandalwood, orange blossom and cedar. The entire combination is meant to evoke the balance between extravagance and refinement, physical journeys and internal Read More Read More daydreaming. After two years as a successful haute couture company, Hayari began offering perfumes and colognes. Since 2011, more than a dozen custom scents have come out of this company. Inspirations range between female sensuality and modern art. Most of the marketing lines combine inspiration from France and the Orient for a unique bouquet every time. The spices, herbs, flowers, fruit and other notes are chosen to their special meaning and the classic ideas they evoke. All products are original, authentic name brands. We do not sell knockoffs or imitations.